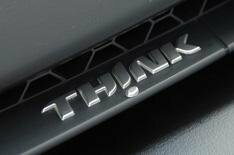 Think City | What Car? Think deserves credit for not simply gutting a production petrol or diesel car and stuffing it full of batteries. The Norwegian firm has developed something from scratch that's pleasant to drive and performs well it accelerated and stopped quicker than all except the Mitsubishi and Tesla in our tests. It also has an impressive range of up to 106 miles, so it's better than the cheaper C1 Ev'ie if you plan to head out of the city. However, a 13-hour maximum charge time is long, and it looks like it'll be expensive when it goes on sale next year. The reality is that Mitsubishi's i MiEV is faster, more practical and will cost about the same money. Final details have yet to be ironed out ahead of next year's UK launch, but Think is considering allowing buyers to lease rather than buy the batteries, which may bring down the cost.